Ghost Stories is a cooperative horror game that forces you to work together to defeat one or more incarnations of Wu-Feng and all of the ghosts that come before him. Each player takes on the role of a Taoist priest who must turn back the evil wave of ghosts and save the village. Ask a villager for help. Attempt to exorcise ghosts by rolling the dice. Each time a turn passes to a new player, a new ghost appears. This is why it is very important to attempt to get ghosts off of the board as quickly as possible each turn. If players are able to handle all of the ghosts that come their way and defeat Wu-Feng, they win. Don’t expect this to happen very often, though. To see a more detailed explanation of the rules, take a look at the official Ghost Stories rulebook (PDF). One of the biggest positives of Ghost Stories is its amazingly beautiful components, especially the ghost cards. Each card is richly-detailed and they blend very well with the player boards and the village tiles. 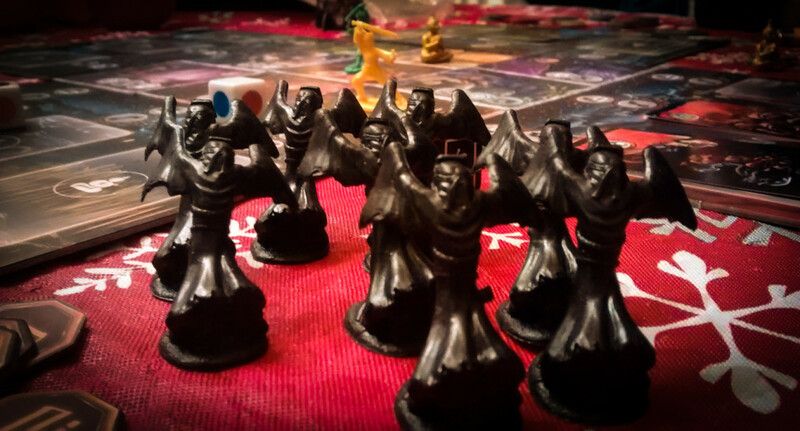 There have been multiple board games made that have attempted to capture this genre’s theme, but we don’t think any have done it as well as Ghost Stories. Designer Antoine Bauza deserves a lot of credit for making the theme pop in this game. Everything – from the villagers to the ghosts themselves – make this game feel like a genuine Japanese ghost story. The relatively short game length makes Ghost Stories a great fit for any board game night. It is also excellent for anyone who loves a highly energetic game that seems to just fly by, rather than creep along. Ghost Stories is also one of our top two player board games. It’s great at all player counts, but it’s one of those rare co-op games that seems to be just as good with two as it is with a full compliment of players. You can use just two characters or you can take two apiece. One thing that could turn people away from Ghost Stories initially is how difficult it is. Even on the “easiest” level, it is very possible to lose five out of six games. With new ghosts appearing each turn, it can be overwhelming to beat them and can get a bit frustrating. That being said, when you do get those rare wins, it just….feels…GREAT! Ghost Stories truly stands out thanks to its high production quality and its smooth gameplay. If you enjoy the horror genre – or even if you don’t, really – this is a must-buy cooperative game for every board game fan out there. Even if you keep losing, you will keep coming back to try to save the village! This is still one of our favorite co-op board games even after playing it many, MANY times. You can test out the game by getting the Ghost Stories app on iTunes. Thanks for taking the time to read our Ghost Stories review! To stay updated on all things cooperative board games, follow us on Twitter, Facebook, or via RSS. It definitely is one of the most challenging co-ops out there.